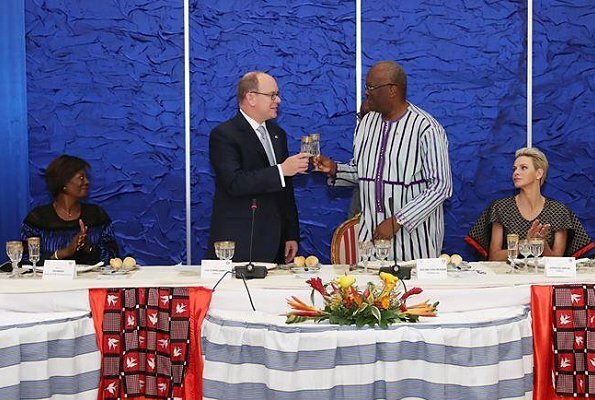 On the 1st day of their visit to Burkina Faso, Prince Albert and Princess Charlene of Monaco were welcomed by President Roch Marc Christian Kaboré of Burkina Faso and his wife Sika Bella Kaboré by a ceremony held at Kosyam Palace. 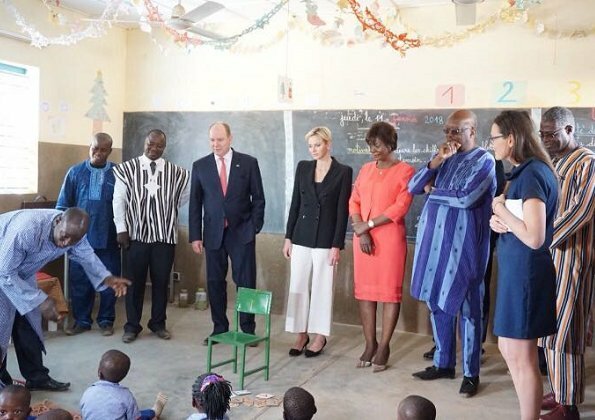 After the ceremony, Prince Albert and Charlene visited Saaba Preschool Education Center with the President and his wife and met with children and educators. In the afternoon, Prince Albert visited National Fire Brigade. State of Monaco provides tools, equipments and training support to professionalize the Fire Brigade. 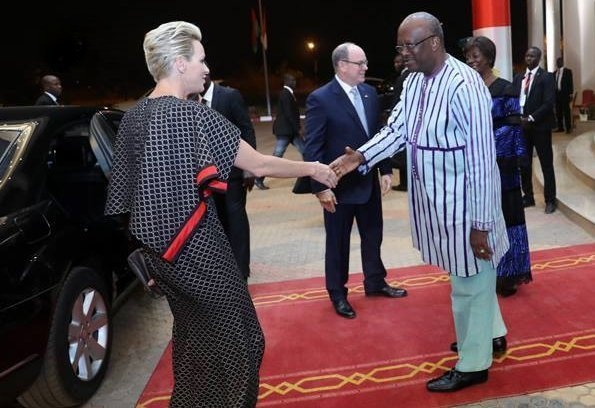 In the evening, Prince Albert and Princess Charlene attended a dinner at Kosyam Palace in Ouagadougou. 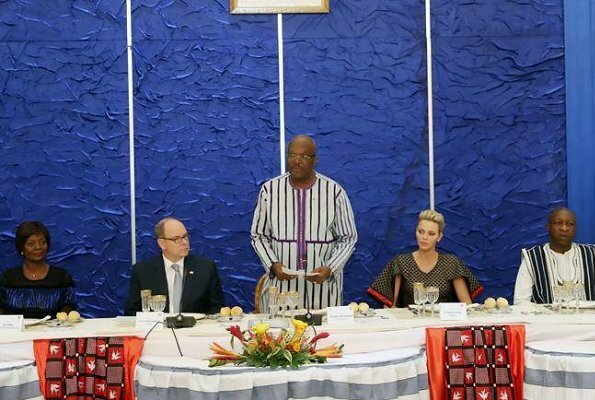 In the evening, Prince Albert and Princess Charlene attended a dinner at Kosyam Palace in Ouagadougou. No, this was no success ... Those cropped pants and jacket with shoulder pads does not fit Charlene's body shape,it makes her look a bit like SpongeBob. Albert looks better then in a long time, he seems happy and looks like he's lost some weight, good for him! charlene heeft er moeite mee om het op te drinken, en albert die heeft er niets van !! het zou voor mij ook niets zijn!!! 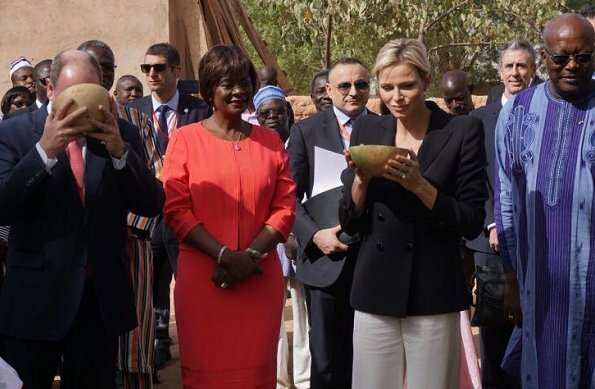 I have to admit that Burkina Faso's First Lady looks much more elegant and event-appropriate than Princess Charlene does. She (Mrs. Kaboré) also carries a pretty handbag. Lovely! I don´t like very much these outfits of her. And she doesn´t seem very happy on the first pictures. Ok. Much appreciated that Charlene loves with her African roots. However, not sure about the dinner outfit. Charlene is a real African - her family have been Zimbabwe and South Africa for several generations. Americans immigrated from many places as well - would you make the same distinction and refer to real Americans? If you mean her European ethnic origins - she is of German, English and Irish extraction not Dutch. Love both looks. That dress is gorgeous as is the president's wife's dress. I don´t think that the black-and-white outfit was especially successful. It looks very dated (think late 80s), the jacket makes her look boxy, and the whole look is too casual for an official visit. White trousers are generally difficult for formal dressing, I think they can only really work as part of a white trouser suit. And cropped trousers are never ok for formal occasions. Needless to say that the combination thereof is bound to go wrong, especially with those semi-casual kitten-heeled shoes. The evening look is ugly, both in concept and in styling. I hope the red panel extends all the way down her dress instead of looking like a sewn-on ribbon. And the cape-like shoulder flaps are too stiff, they look like she´s going to take off. And her hair-style is way too harsh and boyish. Sorry, no love from me this time, although I generally like both black-and-white combos and this dark gray patterned fabric combined with the red. Charlene is doing the right thing i.e. low-key dressing. 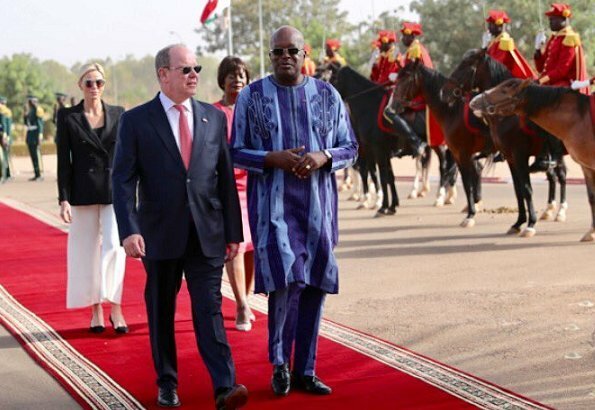 Remember that Burkina Faso is one of the poorest countries in the world. Absolutely agree with your comment, however I believe that Monaco's royalty is always on the very trendy side of fashion, and oftentimes what is fashionable is not necessary becoming, or even eye pleasing. Princess Charlene outfits look great. Pants suit the occasion and gives her the freedom to bend down to the children. Love the evening dress. Not too formal but still very elegant and stylish. When I look at these pictures I get a feeling of a poor neighbour girl coming to wrong event. Of course my second thought is that Monaco´s royals are one of the richest of Europe. What confuses me. Those clothes do not look like she wanted low key. Pants are too short to be becoming and to me black is not a good color to colorfull Africa. Please, Charlene, don't bring the eighties back. This is an old fashioned look and much too casual for a state visit. The first Lad of Burkina Faso looks good in flamingo red, good colour, good cut, good length, good choice. Charlène était magnifique , elle n'est pas venue pour briller , elle est venue pour aider, je rapelle que sa fondation a créer un centre aquatique pour que les enfants apprennent à nager et ne plus se noyer, ce centre apprendra aux jeunes le métier de l'hotellerie et ils ont donné avec le prince une somme de 5000 euros à ce centre pour rnfants défavorisés alors le pantalon blanc et la veste noire n'a aucune importance içi. 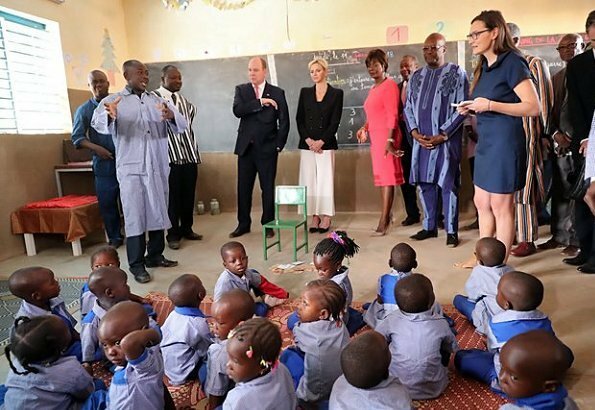 Quand à la femme du président du Burkina Faso, je la trouve bien chèrement habillée pour un pays si ^pauvre, elle devrait prendre exemple sur la princesse plus simple qu'elle. Agree. The cause should be the main subject of discussion . Still, too much emphasis on the shoulders. Most of all, I like the way she interacts with people. 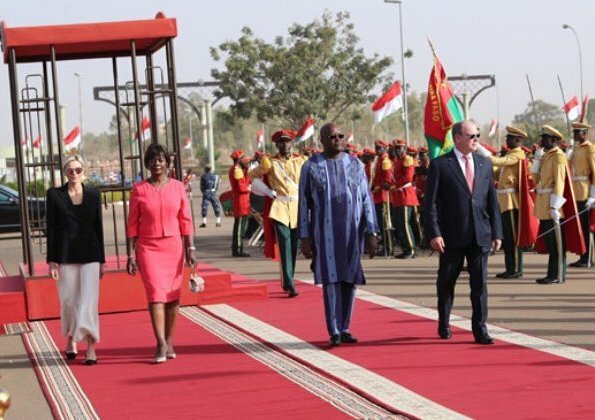 I think it is spurious to suggest that Mrs. Kaboré is too expensively dressed - she isn't poor so no need to dress in rags in sympathy with her fellow citizens. She has a role in her country and she was appropriately dressed for the events - sometimes western style clothes, other times in local outfits. Why denigrate one person in order to praise another? Not necessary - they were doing different things. I do not think Charlene´s top, jacket, trousers combination is any cheap even when they look like it. Anyway this is fashion blog and that is what we mainly look at and write about. FRANNY ik ben het helemaal met uw eens!! !